We’ve talked several times on this show about working with younger firefighters. But we haven’t heard their viewpoint. That’s what we’re doing on this episode. Millennials, those born between 1982 and 2000, are now the largest generation in the workforce. They are sometimes a mystery to previous generations. They learn differently, they react differently. They relate differently. Here to offer some advice to the new guys is a millennial who’s been around long enough to have seen the mistakes young firefighters make. Tom Redden is 26. He’s been a Firefighter/ EMT with the Flanders Fire Department in East Lyme, Connecticut since 2017. 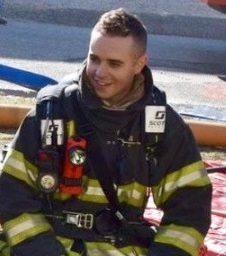 He previously worked as a Firefighter/ EMT with the Electric Boat Fire Department in Groton, Connecticut. Name a popular exterior wall material in non-combustible warehouse type buildings. A popular exterior wall material in non-combustible warehouse type buildings is steel panels or steel siding.